This Technical Bulletin deals with undesired post digital transition reception situations, qualified as “ MISSION IMPOSSIBLE” projects. The reception of Channel 13, WJZ-DT, Baltimore in Cumberland, Md. Observe the Channel 13, Baltimore and Channel 12, Martinsburg distances. The undesired adjacent channel station is six times closer than the desired. The net result: tremendous adjacent channel interference problems on the desired Channel 13, Baltimore. Nor was the reduction of Channel 13, Baltimore’s output power, from 316 kW to 29 kW improving its reception, due to the distance of 90.80 miles. Received signal levels were most of the time in the -25 to -30 dBmV range. Another reception difficulty is demonstrated on the Signal Direction Sheet below. The undesired Channel 12 Martinsburg is almost in-line with the desired Channel 13, Baltimore. Consequently, the original high-gain Channel 13 antenna, receiving comfortably the analog Channel 13 before, could not differentiate between the desired and undesired stations. The main lobe of the antenna’s radiation pattern was much wider than the angular separation between the two stations. There are two alternatives to reduce the adjacent channel interference, producing interference free digital Channel 13 pictures. Contact the FCC and request a more acceptable VHF channel allocation for Channel 12, WWPX-DT, Martinsburg. The chances for a favorable FCC response? Extremely limited. Install a horizontally stacked array of two high gain antennas, with the correct horizontal spacing, to force a deep radiation pattern null into the direction of the undesired station. This is a practical, economical alternative; actually the only chance to receive Channel 13, Baltimore with acceptable picture quality. However, even the best design effort may be easily confounded by Mother Nature. Under inclement weather conditions, when Channel 13 reception is exposed to fading, picture quality may deteriorate. The reception of Channel 33, WCBS-DT, New York in Southbury, Ct.
Channel 2 WCBS, New York, an analog station, was received before June 12, 2009 in Southbury, CT with good picture quality and adequate fade margin. Conditions changed drastically after June 12, when Channel 2, WCBS-DT started operation on its assigned new digital channel, Channel 33, with 284 kW effective radiated power. Suddenly, the New York pictures suffered tremendous co-channel interference problems, introduced by Channel 33, WFSA-DT, Hartford, received from a distance of 30.16 miles. 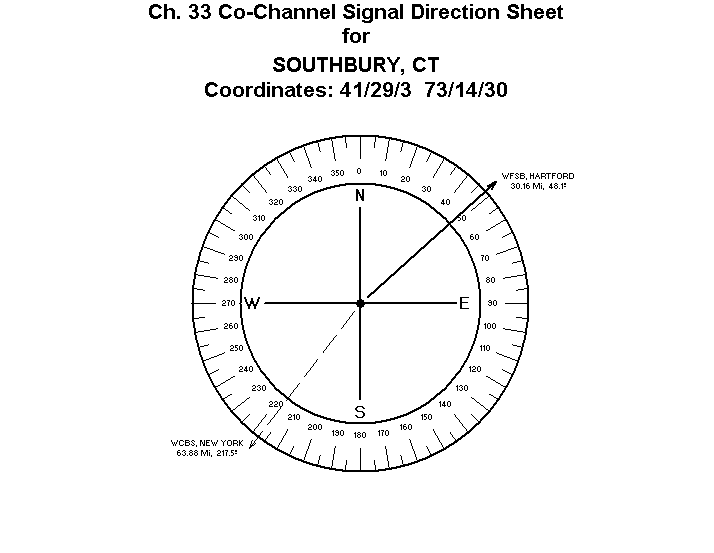 Observe the reception parameters of Channel 33, WFSB-DT, Hartford, as well as Channel 33, WCBS-DT, New York. The undesired Channel 33, artford,from a distance less froffrom a distance of less than half of New York’s 64 miles, will inject extremely strong co-channel interference into the New York pictures. 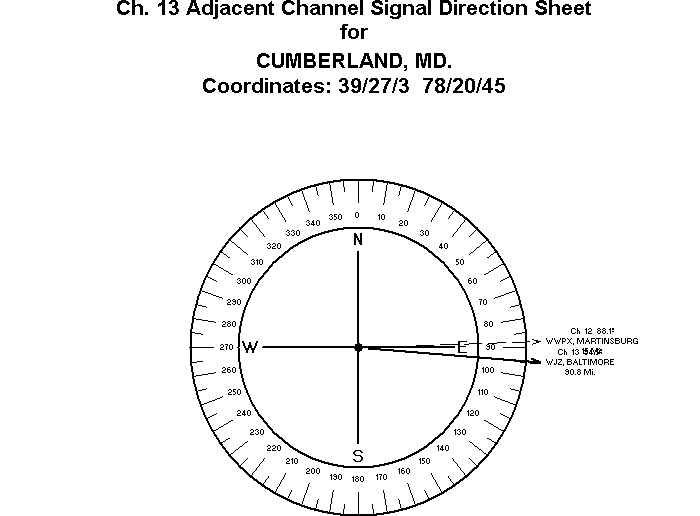 The co-channel signal direction sheet below delivers no new technical information, but it is an excellent visual presentation of actual co-channel conditions. The interfering co-channel is not arriving exactly 180° off-the-desired direction With other words it is not a perfect Front/Bank ratio problem. The 169.5 degree angular separation requires the application of a phased-array of two, horizontally stacked Channel 33 Yagis, to force a deep radiation pattern null into the direction of the co-channel offender. Of course, these Channel 33 interference conditions did not need to develop. Somebody at the FCC assigned the same UHF channel for a Hartford and New York DTV station, despite the fact that they are less than 95 miles from each other. This could never have happened with a Biro Co-Channel Signal Direction Sheet at their fingertips. After the June 12, 2009 Digital Transition, many TV stations in major metropolitan area panicked due to significant loss of audience. The FCC, responding to this uproar, sent engineers to the affected areas and granted output power increases. Channel 6, WPVI-DT, Philadelphia. Channel 6 was granted to increase its output power from 6 kW to 30 kW, a five times increase in power. With only 6 kW you could not receive the new Channel 6 digital signals 15 miles from the station! If you get the impression by glancing through the above listing that the DTV Transition resulted in a number of real-world limitations that the FCC and their “experts” didn’t foresee, you would be correct! These misguided power calculations require fast corrective action. Normally, it would take months and months to obtain power change modification from the FCC. This time the Commission acted as fast as two days. An all time record.